Your Local Car Park Cleaning Specialist. Captain Jetwash offer professional car park cleaning and car park maintenance to commercial and industrial clients in and around the Sussex, Surrey and the London area. We carry out all our jobs quickly, efficiently and safely, and our cleaning teams are available 24 hours a day, allowing us to work around your company’s opening hours and busy schedules. We regularly clean car parks with concrete, block paving, tarmac, kerbing, rubber matting and other external surfaces. Having a nice clean and fresh looking car park can make all the difference to the kerb appeal for your business premises. Our car park cleaning team work 24 hours a day 7 days a week so were able to carry out the work out of hours and at time that is convenient for you and your daily schedule. Contact us now for a free car park cleaning survey. Who have we done work for??? You’ll be amazed by the results everytime. Our fully portable equipment is suitable for any size of car park, whether a single privately owned car parking space or a large-scale commercial multi storey car park. No job is too large or too small for our highly trained team. 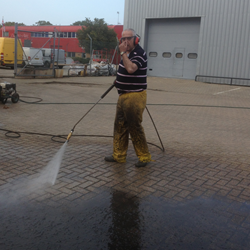 We’re a one stop pressure washing service that can restore your premises to a suitably pristine condition once again. You’ll be amazed by the difference our services make. Contact us now fro a free car park cleaning survey.